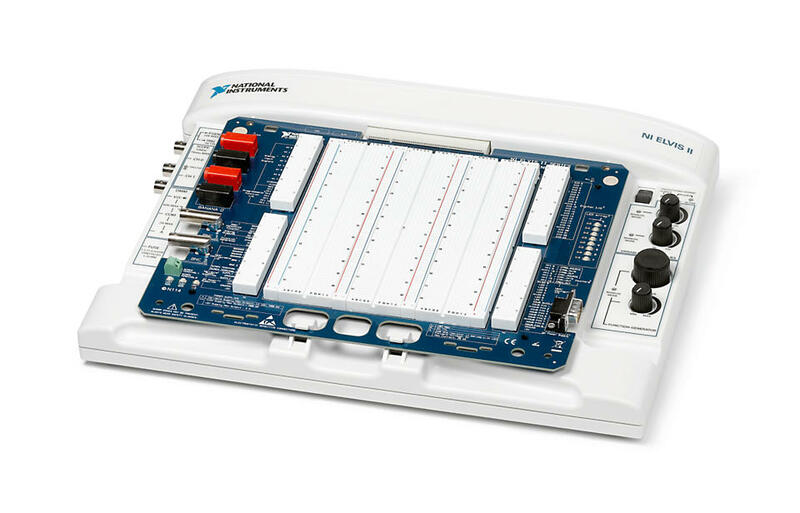 This complete 3-volume lab manual offers hands-on labs for teaching basic analog and digital communication topics such as AM, FM, SNR Concepts, sampling, TDM, and delta-sigma modulation. 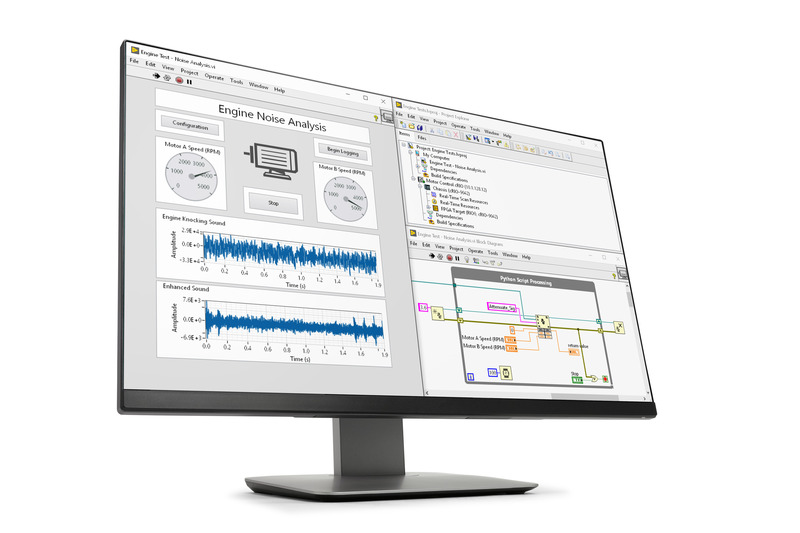 The Emona DATEx Add-on Board combines with the NI ELVIS platform, providing a foundation to assist the student in visualizing and better understanding the concepts. DATEx allows the student to see the intermediate steps and associated signals in the implementation of different modulation schemes. Access to the complete volume of the Emona DATEx add-on board lab manual is provided upon purchase of the product. This experiment introduces students to the NI ELVIS digital multimeter, variable DC power supplies, oscilloscope, and function generator. This lab introduces students to the Emona DATEx experimental add-in module for the NI ELVIS, used to help students learn about communications and telecommunications principles. This experiment introduces students to soft front-panel control of the NI ELVIS test equipment and the Emona DATEx experimental add-in module. This experiment will introduce students to modeling equations by using the Emona DATEx to implement two relatively simple equations. In this experiment students use the Emona DATEx to generate a real AM signal by implementing its mathematical model. Students will add a DC component to a pure sinewave to create a message signal then multiply it with another sinewave at a higher frequency (the carrier), then examine the AM signal using the scope and compare it to the original message. In this experiment students use the Emona DATEx to generate a real DSBSC signal by implementing its mathematical model by taking a pure sinewave (the message) that contains absolutely no DC and multiply it with another sinewave at a higher frequency (the carrier). Students examine the DSBSC signal using the scope and compare it to the original message. In this experiment students use the Emona DATEx to generate a real AM and DSBSC signal then analyse the spectral elements of the two signals using the NI ELVIS Dynamic Signal Analyzer. In this experiment students use the Emona DATEx to generate an AM signal by implementing its mathematical model. Then students set-up an envelope detector using the Rectifier and RC LPF on the trainer’s Utilities module. Once done, students connect the AM signal to the envelope detector’s input and compare the demodulated output to the original message and the AM signal’s envelope. Students also observe the effect that an over-modulated AM signal has on the envelope detector’s output. In this experiment students use the Emona DATEx to generate a DSBSC signal by implementing its mathematical model, then set-up a product detector by implementing its mathematical model also. Once done, students connect the DSBSC signal to the product detector’s input and compare the demodulated output to the original message and the DSBSC signal’s envelopes. Finally, students observe the effect that a distorted DSBSC signal due to overloading has on the product detector’s output. In this experiment students use the Emona DATEx to generate an SSB signal by implementing the mathematical model for the phasing method, then use a product detector (with a stolen carrier) to reproduce the message. In this experiment students generate a real FM signal using the VCO module on the Emona DATEx. First students set up the VCO module to output an unmodulated carrier at a known frequency, then observe the effect of frequency modulating its output with a squarewave then speech. Finally students use the NI ELVIS Dynamic Signal Analyzer to observe the spectral composition of an FM signal in the frequency domain and examine the distribution of power between its carrier and sidebands for different levels of modulation. In this experiment students use the Emona DATEx to generate an FM signal using a VCO, then set-up a zero-crossing detector and verify its operation for variations in the message’s amplitude. In this experiment students use the Emona DATEx to sample a message using natural sampling then a sample-and-hold scheme. Students then examine the sampled message in the frequency domain using the NI ELVIS Dynamic Signal Analyzer. Finally, students reconstruct the message from the sampled signal and examine the effect of aliasing. In this experiment students use the PCM Encoder module on the Emona DATEx to convert the following to PCM: a fixed DC voltage, a variable DC voltage and a continuously changing signal. In the process, students verify the operation of PCM encoding and investigate quantisation error. In this experiment students use the Emona DATEx to convert a sinewave and speech to a PCM data stream then convert it to a PAM signal using the PCM Decoder module. Students then recover the message using the Tuneable Low-pass filter module. In this experiment students use the Emona DATEx to set up a PCM communications system, then model bandwidth limiting of the channel by introducing a low-pass filter. Students observe the effect of bandwidth limiting on the PCM data using a scope. Finally, students use a comparator to restore a digital signal and observe its limitations. In this experiment students use the Emona DATEx to generate an ASK signal using the switching method. Digital data for the message is modeled by the Sequence Generator module. Students then recover the data using a simple envelope detector and observe its distortion. Finally, students use a comparator to restore the data. In this experiment students use the Emona DATEx to implement the VCO method of generating an FSK signal. Digital data for the message is modeled by the Sequence Generator module. Students then recover the data by using a filter to pick-out one of the sinewaves in the FSK signal and demodulate it using an envelope detector. Finally, students observe the demodulated FSK signal’s distortion and use a comparator to restore the data. In this experiment students use the Emona DATEx to generate a BPSK signal using the Multiplier module to implement its mathematical model. Digital data for the message is modeled by the Sequence Generator module. Students then recover the data using another Multiplier module and observe its distortion. Finally, students use a comparator to restore the data. In this experiment students use the Emona DATEx to generate a QPSK signal by implementing the mathematical model of QPSK. Once generated, students examine the QPSK signal using the scope. Then, students examine how phase discrimination using a product detector can be used to pick-out the data on one BPSK signal or the other. In this experiment students use the Emona DATEx to generate a DSSS signal by implementing its mathematical model. Students then use a product detector (with a stolen carrier) to reproduce the message. Once done, students examine the importance of using the correct PN sequence for the local carrier and the difficulty of jamming DSSS signals. In this experiment students use the Emona DATEx to set up a bandwidth limited signal then use it to explore the difference in the spectral composition of a sampled signal produced using a variety of sampling frequencies above and below the Nyquist Sample Rate. Students then use undersampling to demodulate the bandwidth limited signal and recover the message. Finally, students explore the effects on the recovered message of mismatches between the modulated carrier’s bandwidth and the frequency used for undersampling. Students use the Emona DATEx to generate a DSBSC signal then add a carrier to it afterwards. After adding the carrier, students make necessary phase adjustments using the kiss test to turn the DSBSC signal into an AM signal. Then, students use the product detector to recover the message from the AM signal. Students use the Emona DATEx to set-up an AM modulator. Then, they set-up an envelope detector and product detector that receive the AM signal via a bandwidth limited and noisy channel and make SNR measurements for three levels of channel noise. Both SNR figures are compared for noise performance of the two demodulators. Students use the Emona DATEx to set up a single-channel PCM communications system. Then, students activate the PCM Encoder and Decoder modules' TDM mode to transmit two sets of PCM data between the modules. Finally, students modify the set-up to transmit and reconstruct two signals to model a dual-channel TDMA telecommunication system. Students use the Emona DATEx to generate a DSBSC signal then insert a carrier at the same frequency as the carrier used to generate it. They will then adjust the inserted carrier for quadrature using the scope and hearing. Finally, the signal will be limited and filtered to convert it to PM. Students use the Emona DATEx to generate a real PDM signal using independent messages by implementing its mathematical model. Once generated, students will examine the effect of phase division multiplexing on bandwidth. After this, they will examine how phase discrimination using a product detector can be used to pick-out one message or the other. Students will set up a pulse-width modulator (PWM) using the Emona DATEx comparator module. The modulator is verified and observed in operation for an AC message signal. Students use the Emona DATEx to generate a DSBSC signal using a 1kHz sinewave for the message and a 2kHz sinewave for the carrier. The DSBSC signal's upper sideband is removed by adjusting a low-pass filter to isolate the inverted message. Students use the Emona DATEx to generate an AM signal, then implement a phase-locked loop (PLL) to generate a local carrier that is synchronized to the AM signal's carrier. Students use the Emona DATEx to add noise to a message (a digital data signal). The signal will then be band-limited to model the type of noise-affected signal that is possible at the output of a receiver. Students use this signal for determining signal-to-noise ratio figures for a variety of noise levels and observe the effects of noise and band-limiting using Eye Diagrams. Students use the Emona DATEx to set up a PCM communications system to determine the SNDR of the signal on the PCM decoder's output. Then, students complete the PCM system with the addition of a reconstruction filter and measure its SNDR. Students use the Emona DATEx to generate an ASK signal using the switching method. Digital data for the message is modeled by the Sequence Generator module. Students then recover the data using a product detector and investigate the importance of carrier synchronization in product detection. Students use the Emona DATEx to implement the switching method of generating an FSK signal. Digital data for the message is modeled by the Sequence Generator module. Students then recover the data by using a filter to pick-out one of the sinewaves in the FSK signal and demodulate it using an envelope detector. Students use the Emona DATEx to generate FSK and a model of GFSK to compare the difference between the two signals in both the time and frequency domains. After this, students demodulate GFSK using an FSK demodulator and observe the effects on the demodulator's output. Students use the Emona DATEx to consider a 31-bit and 255-bit binary number sequence in the time domain. Then students look at the data signals' spectra in the frequency domain to confirm their spectral composition and use the sequences to generate electrical noise and compare their effectiveness. Students examine the four DATEx line code equivalents of a standard TTL data signal in the time domain and compare them to their theoretically predicted waveshape. Next, they examine the signals in the frequency domain to establish that one of them is different to the other three in terms of its spectral composition. Students use the Emona DATEx to implement the delta modulation scheme. They will adjust the integrator's step size to observe the effect on the delta modulator's slope overload and granularity characteristics. Finally, students demodulate the delta signal using low-pass filtering and investigate the quality of the recovered message qualitatively and quantitatively using SNDR. Students use the Emona DATEx to implement the delta-sigma modulation scheme, and then demodulate the delta-sigma signal using low-pass filtering. Students use the Emona DATEx to implement a contemporary method of frequency modulation using Armstrong's modulator and harmonic multiplication, and then use the FM signal's spectrum to determine its modulation index. Students are introduced to the idea of learning to access and control the "low-level" LabVIEW blocks for the various DATEx hardware functions. 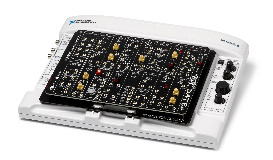 Students will investigate the use of the Amplitude control blocks available in the DATEx board, including the adder block and the amplifier block. Students investigate the use of the frequency control blocks available in the DATEx board including the Tunetable LPF block (TLPF). Students investigate the use of the phase control blocks available in the DATEx board, which control the phase shift of a signal in the phase shifter block. Students investigate the use of the timing control blocks available in the DATEx board, which control position and width of pulses via the twin pulse generator (TPG) block. 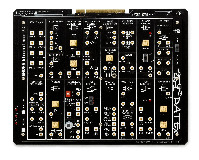 Students investigate the use of the mode control blocks available in the DATEx board, which control the mode switches of particular circuit functions with the PCM/TDM block and the sequence generator block. Students learn how to command several DATEx blocks one after another in a continuous loop. Students learn how to use NI ELVIS instruments on the DATEx, including digital I/O, the function generator, analog I/O, and the variable DC source. This section details several examples of creating controlled DATEx experiments through LabVIEW. This section proposes further suggestions for advanced programming experiments using the LabVIEW and DATEx environment. This section outlines some of the key steps involved in enabling remote control of the DATEx across a network. The Emona DATEx Add-on Board is a plug and play telecommunications board that enables students to easily learn the fundamentals of modern communications theory.